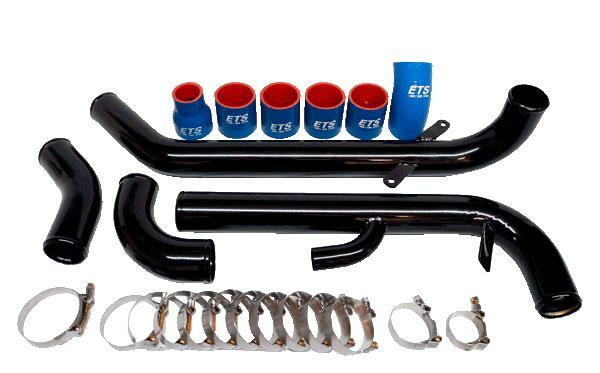 The ETS Intercooler Piping starts off by immediately expanding into a specific diameter right off of the turbo elbow. This replaces the tiny factory pipes and instantly frees up horsepower and greatly improves spool up. From here it follows stock piping paths for easy and beautiful installation. Once the air passes through the intercooler, the piping takes the shortest and most direct path to the throttle body. The ETS design eliminates unnecessary piping which results in greatly improved spool up and transient response. With a substantial increase in cross sectional area, flow is increased as well. ETS Intercooler Piping Kits come in a variety of configurations. By default, the Piping is Silver, the BOV Flange accepts Stock, TXS or Greddy BOVs, and the Couplers are Blue. However, any of these attributes (and more!) can be customized. If ordering online, please specify any custom options you want in the Comments section during checkout (some additional charges many apply).